So, today I'm headed for Cardiff. Yes. Cardiff. In Wales. Yes. That Wales. For the whole day. Yes. A whole day. There's a few reasons why. Chief among them is that even though there's a Doctor Who Exhibition at Earl's Court here in London, not two stops away from me, I'm going to the DW Exhibition in a mall in Cardiff. The show's shot nearby, and uses several exteriors around town. So it just seems more authentic (for the new incarnation of the series), to go visit this location and then walking around town. 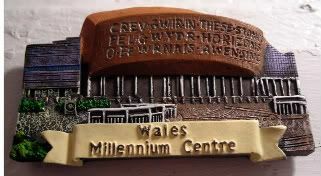 But, a really big reason is for this building here - the Wales Millennium Centre. It's a working theatre, designed by Jonathan Adams. And, if you've ever watched Doctor Who and its spin-off Torchwood, you'll have seen this gorgeous building. Belowground is where the Torchwood hub is, on the show. But, the venue is on the 1001 Buildings to See Before You Die list, and so I'm checking it off with (hopefully) a tour today. My favorite part of the building is the facade, where the giant words are first in Welsh, and then in English - and if you look carefully at the magnet, you see the phrase is: In These Stones, Horizons Sing. There's just something awesome about it. OK, I probably won't be back in time to edit this post, and the next magnetpost will be superlate tomorrow night. And, gosh. It looks like I'll have to buy a whole other magnet to talk about the actual tour. I know you're shocked. I had the best tour yesterday - a native Welsh actress from Swansea, with a gorgeous accent to boot. So much fun, and I was the only one on her tour. Plus, how fitting is it that she was actually in a Doctor Who episode, as well. She was very proud of the heritage of the building and Wales, and it was a lovely thing to see. She went through all the details behind the design elements, and explained the inscription on the front of the building. It's not a direct translation - the poem was written half in Welsh, half in English. It says: "Creating truth like glass from inspiration's furnace, In these stones horizons sing." I would highly recommend it, and definitely taking the tour. It's a gorgeous venue. And the Welsh are the nicest people on the planet.